Shenzhen's Futian District is determined not to fall behind Nanshan in displaying its technological prowess. At 7pm, June 29, 35 buildings and five squares in the heart of Futian lit up with LED lights in purples, blues and reds, according to Southern Metropolis Daily. 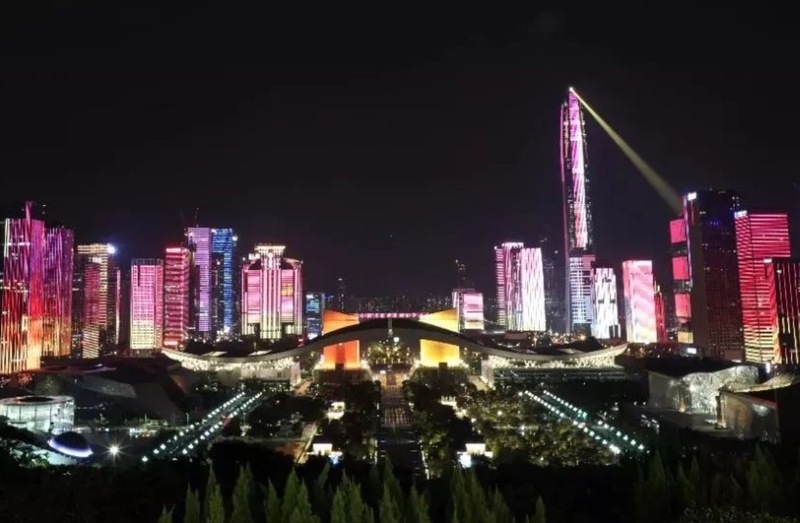 An undertaking designed to commemorate the 40th anniversary of Shenzhen's reform and opening up, this light show was choreographed by the city's Urban Management Department and scheduled to enter testing mode starting June 29 from 7pm to 12am each day. Swarms of people — some arriving as early as 11am, according to one interviewee — gathered at Lianhuashan Park and by Civic Center to view the project the day after its premiere. In fact, too many did. Southern Metropolis Daily reporters estimated a turnout of 80 thousand or so at the height of the light fest on Saturday. So while the 35 buildings created an eye-catching panoramic glow, the streets and walkways also glowed with the screens of upturned phones. People who, afterwards, needed to get home. The Children’s Palace and Civic Center metro stations took precautions to regulate the flow of people, suspending the fare system to speed up passage with the help of over 500 station workers. Hongli Lu, Caitian Lu, Fuzhong Yi and Er Lu, among others, were so congested with traffic that Baidu maps marked the roads red. Social media platforms such as Wechat and Weibo were flooded with users’ posts on the light show, as well as facepalm emojis in response to the massive turnout. The sheer number of people who showed up to catch a glimpse of the project caused government authorities to think twice. Concerned with public safety, the Urban Management Department has canceled all testing of the light show for the time being, according to a mass text sent out on June 1 from Shenzhen’s official early warning alert system.